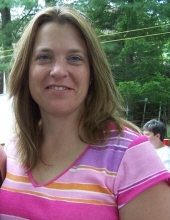 HURDLE MILLS: Mary Pat Scott, 53, passed away on Sunday, March 17, 2019 at her home in Hurdle Mills, surrounded by family. She was diagnosed over two years ago in January of 2017 with Stage IV Pancreatic cancer. She was born in Rome, New York to John and Natalie Roberts. Mary Pat graduated from Rome Catholic High School and went on to receive a Bachelor in Business Administration from SUNY Polytechnic Institute and a Bachelor in Environmental Sciences from Missouri Southern State University. On July 16th, 1988 she married David and they shared joys and sorrows for 31 years. Mary Pat was warm and outgoing and had a laugh that brightened everyone’s day. She was a very loving person and made friends where ever she went. Mary Pat was a member of Holy Family Catholic Church and before her diagnosis she volunteered at the church teaching confirmation classes. She was a devoted catholic who enjoyed attending Traditional Latin Masses and praying the Rosary. She enjoyed preparing and cooking meals with family and friends, especially over the holidays. She was passionate about growing her own vegetable gardens and using the vegetables for her cooking ventures. Ocracoke was one of her favorite places to visit and spend time with family. Camping with family and friends, spending time outside, and crocheting/knitting were some of her favorite activities. In addition to her parents, Mary Pat is survived by her loving husband, David Scott; son, Brian Gregory Scott; daughters, Margaret Rose Scott, Erin Teresa Scott, Jayne Morgan Scott; brothers, David Roberts (Rose), John Roberts (Michele), Timothy Roberts (Kelle); and sister, Jennifer Dontino (Robert). The family will receive friends from 6:00 – 8:00 PM, March 21st, 2019 at Clements Funeral Home. A funeral mass will be held at 2:00 PM at Holy Family Catholic Church, March 22nd, 2019. In lieu of flowers, the family request that memorial donations be made to the National Pancreatic Cancer Foundation at PO Box 1848, Longmont, CO 80502. To send flowers or a remembrance gift to the family of Mary Scott, please visit our Tribute Store. "Email Address" would like to share the life celebration of Mary Scott. Click on the "link" to go to share a favorite memory or leave a condolence message for the family.